Fragaria bonariensis Juss. ex Pers. Fragaria chiloensis ananassa (Duchesne ex Rozier) Ser. Fragaria chiloensis calyculata (Duchesne) Ser. Fragaria chiloensis tincta Duchesne ex Sm. Unknown in the wild, the plant is widely cultivated, especially in the temperate zone but also at higher elevations in the tropics, for its edible fruit. A hybrid of garden origin, arising in Europe around 1750 as the result of a cross between Fragaria chiloensis and Fragaria virginiana. Oat straw should not be used as a mulch since this can infect the strawberries with stem and bulb eelworm. 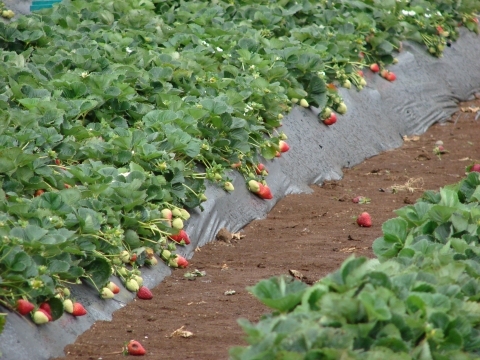 Strawberry plants are very subject to virus diseases, these are usually spread by an aphid. Plants tend to degenerate after a few years and need to be replaced. Seed is a safe means of propagation though, since this species is of hybrid origin, the seed will not breed true. Seed - it can take 4 weeks or more to germinate. The seedlings are very small and slow-growing at first, but then grow rapidly. Prick them out into individual pots when they are large enough to handle and plant them out when large enough. This is a hybrid species and seed will not breed true, though this is the only way to develop new varieties. ]. The runners can be planted out direct into their permanent positions.